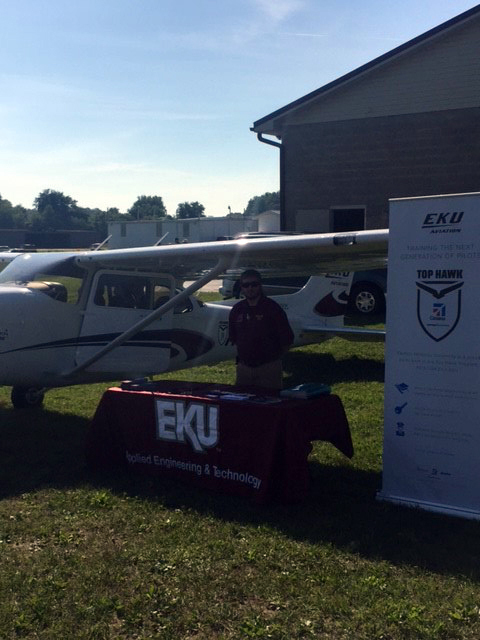 EKU Aviation is 'on the road' so to speak with a fly-in to Henderson City-County Airport (KEHR). The public use airport, located in western Kentucky, hosted its June Fly-in this week. 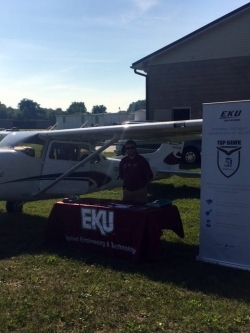 Randall Humphries (pictured), senior Aerospace Management management major from Maysville, accompanied flight instructor Harold Mason in the EKU Top Hawk Cessna to the event. EKU is one of just five universities as a Top Hawk partner for 2017. Textron Aviation provides a custom branded Cessna Skyhawk 172 for use by each university for the year. Universities selected are renowned for innovation in their aviation programs. In addition to the aircraft, top students from each university are chosen for a Textron Aviation summer internship. To help meet the need for qualified pilots, EKU Aviation has partnered with Kentucky Community and Technical College System facilities (KCTCS) co-located with nearby regional airports to create '2+2 agreements'. Through these partnerships, students may complete their aviation bachelor's degree course work online with required flight hours at the partner regional airport.